WEST PALM BEACH, Fla. --- Sikorsky delivered the first CH-53 King Stallion helicopter to the U.S. Marine Corps (USMC) today. The aircraft is the first of an expected 200 helicopters for the Marine Corps' fleet. The CH-53K is the new build replacement for the U.S. Marine Corps' aging CH-53E Super Stallion fleet. The CH-53E first flew in 1974 and entered service with the USMC in 1981. "Our first delivery of a CH-53K to the Marine Corps marks the start of a new generation of true heavy lift helicopter deliveries by Sikorsky that bring unsurpassed and expanded capability across the modern battlefield to provide tremendous mission flexibility and efficiency in delivering combat power, humanitarian assistance or disaster relief for those in need," said Dan Schultz, Sikorsky President and former CH-53 pilot. "With 18 additional aircraft in various stages of production already, the entire Sikorsky team, in partnership with our suppliers, is looking forward to additional deliveries to delight our customer." This first CH-53K heavy lift helicopter will be stationed at Marine Corps Air Station New River in Jacksonville, North Carolina. There the helicopter enters into the Supportability Test Plan. U.S. Marines will conduct a logistics assessment on the maintenance, sustainment and overall aviation logistics support of the King Stallion. This assessment also will validate maintenance procedures with Marine Corps maintainers conducting hands-on care/upkeep of the aircraft. The Supportability Test Plan will ensure readiness and support on the flightline when CH-53K helicopters enter into service with the USMC. Sikorsky expects to deliver its second CH-53K helicopter to the USMC in early 2019. The CH-53K test program recently completed the following milestones: maximum weight single-point cargo hook sling load of 36,000 pounds (16,329 kilograms); forward flight speed of over 200 knots; 60 degrees angle of bank turns; altitude of 18,500 feet mean sea level (MSL); 12-degree slope landings and takeoffs; external load auto-jettison; and gunfire testing. "I am very proud of the work accomplished to deliver the most powerful helicopter ever designed into the hands of our Marines," Lt. Gen. Steven Rudder, Deputy Commandant for Aviation, said. "And confident in the teamwork and dedication in this program which will carry us to IOC (Initial Operational Capability) next year." 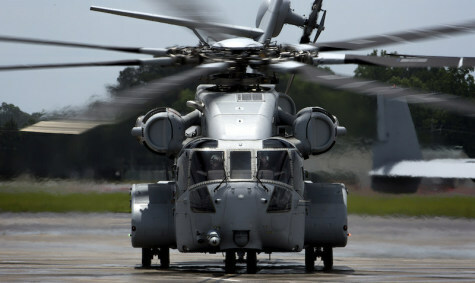 Sikorsky is preparing its manufacturing facility in Stratford, Connecticut, to house CH-53K production beginning this summer. The heavy lift helicopter made its international debut and showcased its maneuverability and advanced fly-by-wire technology during demonstration flights at the recent ILA Berlin Air Show in Berlin, Germany. The CH-53K is an all new aircraft, using modern intelligent design. The rugged CH-53K helicopter is designed to ensure reliability, low maintenance, high availability and enhanced survivability in the most austere and remote forward operating bases.